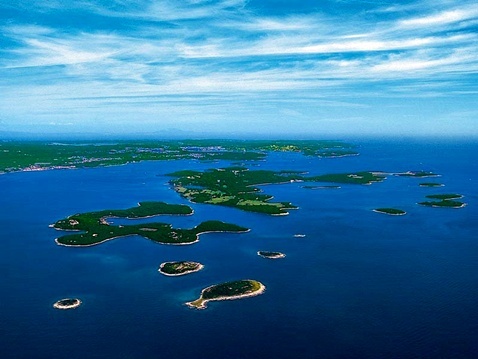 Istria, the miniature continent, the largest Adriatic peninsula, ideally dives into the sea in the south direction. Endowed with abundant nature and natural diversity, from the National Park of the Brijuni Islands and its 14 islets, to the botanical reserve Motovun Forest (with their most precious types of truffles, white 'Tuber magnatum Pico' and black 'Tuber Aestivum Vitt'), from Lim channel, a 10 kilometers long line, carved into the peninsula with breeding site of the appreciated gastronomic delicacies, oyster shells, to the mountain Cicarija with its highest peak Ucka (1396m), in the east of the peninsula. After the military defeat of native Histrians in the 2nd century BC, citizens of Istria improved the economy and manufacture, particularly the production of amphorae. For two thousand years ago the western part of Istria was settled by Romans. Here they produced "Oleum ex albis olivis“, the maximum quality olive oil (today known as Extra Vergine). The field of production of ex albis was a triangle between Vodnjan, Barbariga and Fazana (Fažana). In Fazana (Fažana) the largest production of amphora, which were used for the transportation of the olive oil and wine, was found. It is interesting that all the Roman emperors had their olive groves in Istria. Even today, this is the area where the highest quality of oil is being produced. They are known for their strong healing properties, richness in vitamins A and D, very beneficial effects on the skin elasticity, heart health and blood vessels, reduction of cholesterol. An olive tree almost 1650 years old, from the Roman times, grows on the Brijuni Islands and bears fruit every year.